Note: The history of the Phillies’ Quaker nickname prior to 1890 is the subject of a bit of debate, largely because nicknames were somewhat unofficial in baseball’s early years. And in an odd move, in 1944 and 1945 the Phillies experimented with changing the team nickname to the Blue Jays, and went so far as to add a Blue Jay on the sleeve of the jersey, but the name never caught on they remained the Phillies during this two year period. Thus it is generally acknowledged that the Philadelphia Phillies are the longest standing same-named, same-city team in American professional sports. 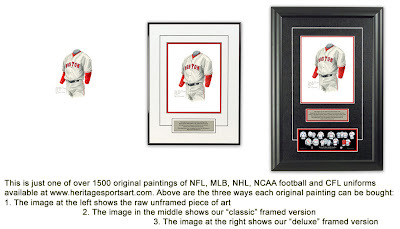 If you love the Philadelphia Phillies and the history of the Phillies franchise, you might really love to own an original piece of artwork celebrating the team's historic uniforms as seen in the poster at the top of this blog - you can actually own one of those original pieces of art! There are only 17 pieces of original art available for sale, and when these 17 are sold, that's it, they're all sold out. If you would like more information about this great artwork including the three ways you could purchase each piece, please visit our Philadelphia Phillies YouTube video at www.youtube.com/watch?v=X_bWnC8IPas or go directly to the artwork website www.heritagesportsart.com/Philadelphia-Phillies-c153/ where you can see and purchase the artwork. And please search my blog archive http://heritagejerseys.blogspot.com/ for other blogs on the history of the Phillies.